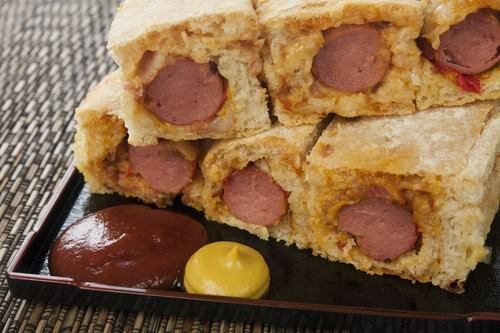 I make these cute little hotdogs, or Pigs in a Blanket, every few weeks for the children and they always work well. This time, when I want to feature and photograph the little buggers they come out looking irregular shaped and boxy! Rest assured I remade and rephotographed them, but here are some less than beautiful examples. I had the house air conditioning on a temperature of 17C because I had been dying in the summer heat. I didn’t think it would matter because the bread dough was made in the controlled environment of the breadmaker. It did matter because I couldn’t get to the dough when it finished. After proofing beautifully it deflated horribly. I persisted with the dough as it is usually very resilient in the face of my haphazardness, but having the air conditioning on freezing I was struggling to get the “puff” I usually do. 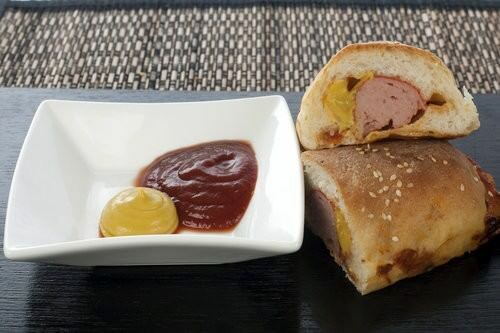 To add insult to injury, on my tortured dough I added frozen frankfurts. Straight from the freezer! Next, I rolled them up as usual but, I squeezed the hotdogs into a pan that was too small to allow any growth of the little snacks. I covered the buns with a tea towel for the second proofing. Obviously, nothing was going to happen in the cold environment and packed into a little tray. But with the ultimate optimism, I put the oven on warming 50 degrees, and left the buns to proof. It usually only takes ½ hour to get the nice puff. After about 1 ½ hours I decided that I didn’t have time to wait for them to proof anymore and baked them off. The result was less than spectacular! Then, because the hotdogs had taken so long it was nearly dinner time and I had a starving family. Everyone wanted one! This meant the family was breathing down my neck trying to “sneak” a taste while I was taking the images of the finished product. EPIC FAIL MUM! Oh the life of a foodie! 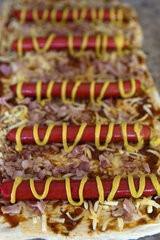 Even though they were the ugliest Hotdogs I have ever made they were well received by the family. They smelled divine cooking, and there are now none left, so obviously they tasted pretty good too. Prepare a cookie sheet with baking paper. Place all the bread ingredients into a breadmaker with the setting onto dough. Once the dough is complete, place it on an oiled bench and with your hands, gently shape into a large rectangle, as thick as you would make a pizza base. 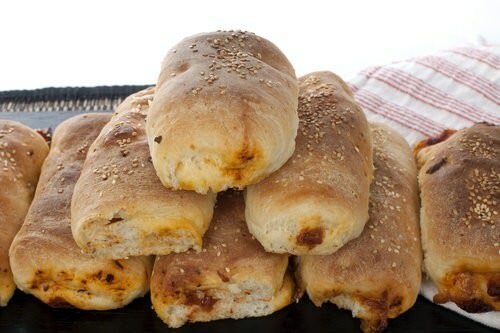 Spread the dough with tomato paste then add the cheese and bacon ensuring the ingredients are evenly distributed. Place the franks on the dough and roll into little buns. 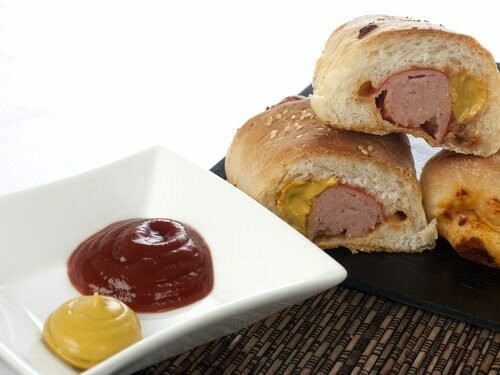 Cut the dough around the frankfurts and roll into parcels, continue until the dough is all rolled into hotdogs, and the hotdogs are all on the baking tray. Sprinkle the hotdogs with sesame seeds and cover with a clean tea towel to proof. If the house is cold, place in a warm area, or use a warm (50C/120F) oven. Once proofed preheat oven to 180C/355F. Bake for 15-20mins or until golden and sound hollow when tapped on the base. The second batch of hotdogs is now complete. They still aren’t the most beautiful things I have made but at least they don’t look mangled anymore. The bread is light and fluffy as it should be and they have a level of respectability about them.